'Sky Of Blue' (Paul Black, R 2011 ). Seedling# P142D, SDB, 15" (38 cm), Early midseason bloom. Standards medium light blue, darker blue texture veins; style arms light violet, medium blue crests and midrib; Falls medium violet-blue shaded to medium blue margin, light blue rays beside beard, brassy plum veins in throat; beards light tangerine in throat, white base tipped tangerine in middle, white at end. 'Canadian Kisses' X 'Fires Of Fiji'. Mid-America 2011. From Mid-America Garden catalog, 2011: SKY OF BLUE (Black ‘11) SDB Early-Midseason 15” (38cm). 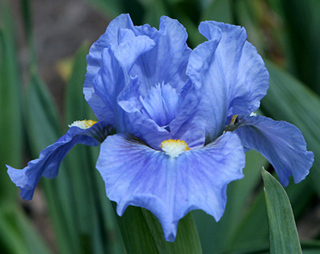 Standards of clear mid blue flowers have slightly darker texture veins. Falls have slightly darker violet blue wash over upper third. Golden yellow beards end in white tip. Sky of Blue is a strong grower. Clumps are filled with stalks. Sdlg. P142D: Amateur sib. $18.00. jpg BHP_5196-X2_sky_of_blue.jpg manage 90 K 11 Feb 2016 - 19:46 BrockHeilman Please contact Brock Heilman for image use.